You can find the best Regions bank credit cards below. We have made a list for you for low interest rates (APR), best rewards, no annual fee and best cash advance APR rate. Regions Premium Visa is the best opportunity for you here with 13.99% annual percentage rate. However it is good if you love to spend with credit cards since there is $125 annual fee of Regions Premium Visa. 1.5 rewards point for every $1 is also another good promotion of Regions Premium Visa. The alternative solution Regions Life Visa has 13.99%-22.99% rate. When you compared it with other options on here, it is also good one. However If you get a regions life visa, you are not going to get any rewards. You won’t still pay annual fee though. There are two Regions Bank credits card that you don’t need to pay annual fee… Both cards are similar. There is 1 percent difference at interest rates. There is also rewards for Regions Prestige Visa. You should think about how much you will spend with your credit card and decide to pick one of those above. There are also two credits card that you can get reward from Regions Bank. Regions Premium Visa will reward you 1.5 points for every single $1. Regions Prestige Visa is going to reward you 1 points for $1. Prestige Visa has no annual fee. Regions Premium Visa has some advantages with interest rate and cash advance APR. We believe that Regions Premium Visa is the best option for rewards. Besides the interest rate of the card is going to be quite profitable for you. Regions Premium Visa is one of the best opportunities for you as a credit card for travel, when you compare it with other cards of Regions Bank. You can redeem your reward points for travel and you can use various advantages of credit card while travelling. We summarized all features in our table but you can find more information at Regions Bank‘s website. All cards except Regions Premium Card is not the best option for you. However when you compare the premium card with other travel cards, it is not also very beneficial. If you would like to have a well-balanced card with minor travel features, Premium is the card which you are looking for. 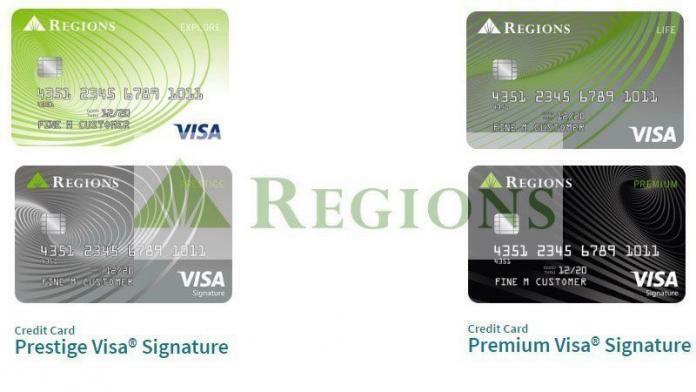 The best annual percentage rating credit card of Regions Bank is Regions Premium Visa at the moment. It has only 18.99% rate at the moment. Other cards have the same percentage with 26.99%. We provided best regions bank credit cards for you on this page. We are going to provide more information about those cards near feature. You can also see business card opportunities in Regions Bank. Regions Premium is recommended. Very low APR with good rewards rates. © Credit Card Karma. All rights reserved.